Awesome Friday! » Blog Archive The Legend of Korra: Episode 2.05 Recap, Thoughts & Speculation - Awesome Friday! Episode 2.05 aired last night, so here’s my weekly recap, thoughts and speculation. I’m going to start out by saying that this one was difficult to write. I want to love this season, I really really do. I also prefer to focus on the positive, because there’s so much criticism and cynicism on the Internet already, and I’m grateful that we’re getting more seasons in the universe I adore. This episode, however, clinched a few things that have been bothering me about this season so far, and this week’s Thoughts section is going to discuss those. First, though, let’s do the episode recap. Spoilers ahead! Korra, Asami, Bolin, Mako, Varrick and Zhu Li arrive at Republic City. 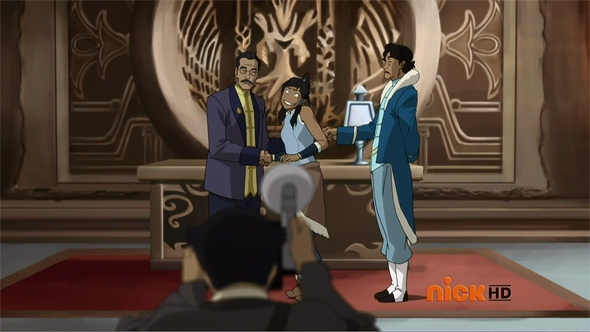 They’re greeted by police chief Lin Beifong, who wants Mako to help supervise a Southern Water Tribe peace march. Ignoring Mako’s advice to stay neutral, Korra decides to lead the march. The march is just passing by the Southern Water Tribe Cultural Centre when Mako witnesses a couple of firebenders press a button on a detonator, setting off blasts inside the Centre. The firebenders get away before Mako can apprehend them, but he finds one of their detonators. In spite of this, Korra is convinced that the blast was Unalaq’s doing. Unalaq, meanwhile, is ignoring the rebels, ordering his troops to keep the spirit portal safe. He sends Desna and Eska after Korra — he needs the Avatar captured alive so that she can open the northern spirit portal. While this is happening, Bolin, touring the town with Varrick, ends up being the centre of attention at the pro-bending arena. Sensing Bolin’s natural showmanship, Varrick decides to cast him as an actor in his moving pictures. His first planned film is a propaganda film to sway public opinion in favour of the Southern Water Tribe. The next step to help the tribe on the political front is to get the United Republic Army on board, and so Korra and Varrick meet with President Raiko. The president seems more interested in a photo op with the Avatar than talking politics, and he refuses to help. Frustrated, Korra meets with Varrick, Asami and Bolin. Varrick reveals his plans for the propaganda film he’s making with Bolin and suggests she go to General Iroh II directly to enlist his help behind the president’s back. Varrick also suggests that Asami supply the South with weaponry, allowing her to make a profit for her failing company. When Bolin excitedly shares all these details with Mako, however, Mako is less than enthusiastic. He’s busy trying to identify the bombers in a book of known criminals. Coming across a photo he recognizes, he hurries to the police station to show Chief Beifong. She’s busy, and a couple of fellow officers, clearly enjoying ruffling Mako’s feathers (and possibly paid off), take his evidence and shove it out of sight. Shortly after this, President Raiko confronts Mako and pressures him into spilling Korra’s plans. So, as Korra and Iroh are discussing their plans, the president shows up to shut them down. Iroh suggests she speak directly with the Fire Lord herself. Returning to Republic City first, Korra finds out through Bolin that Mako was the one who alerted President Raiko. She confronts Mako at the police station, where, frustrated, he breaks up with her. 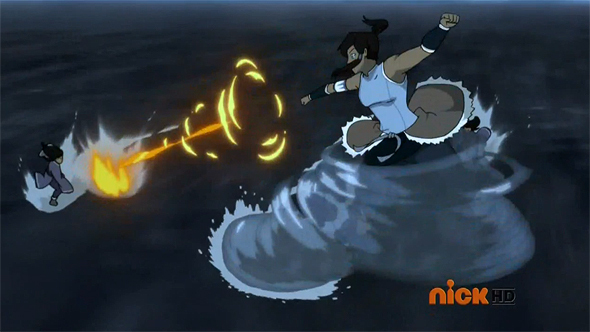 A weeping Korra heads out onto the ocean, still intent on reaching the Fire Lord, but she is pursued by Desna and Eska. A brief battle breaks out between them, but they’re interrupted by a giant ocean spirit. The twins fall back, and Korra goes into the Avatar State to try to calm the angry spirit, but it swallows her whole. At the Southern Air Temple, Meelo is having no success training his lemur. 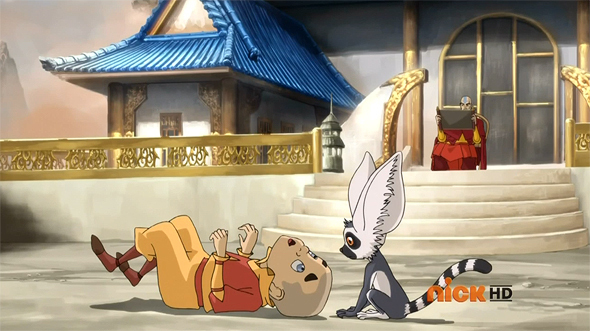 Tenzin trains Meelo to be a trainer, but accidentally creates a monster: Meelo trains every lemur on the island. As I mentioned above, I am trying really hard to like this season, but there are a few things that have been bothering me so far. I generally try to keep a positive slant on my reviews, because I truly love the IP, I respect the creators and their process (both as a fan and as a fellow entertainment industry professional), and I feel it’s more fun to try to enjoy something than to rip it to shreds. Unfortunately, my frustration has been building, and with this episode, it came to a head, so I feel the need to air some of the issues I’m having so far. I’m really hoping some of this will smooth out later in the season. First of all, let’s talk animation. I’ve mentioned this in previous weeks’ recaps, and this episode was especially bad: every character was constantly off-model, every discussion had the flapping mouths problem, and even the action sequences felt stiff. It isn’t just the animation itself, but the composition of the shots, which are often boring front-on shots of the scene. Part of what made Book One so stellar was its dynamic animation and storyboarding, and everything this season feels wooden in comparison. The problem with this is that if you take stellar voice acting and drop it onto stiff animation, the voice acting and dialogue are going to seem terrible, because the characters aren’t visually emoting properly. There’s no question in my mind that the voice acting this season continues to be fantastic, but when paired with the sub-par animation, it feels off. I’m already excited for the return of Studio Mir in Book Three, because I miss the amazing animation that was such a visual treat in Book One. Another major problem I’m having with this season is the lack of threat. In Book One, we got dropped into the middle of a conflict that provided urgency: Amon could take away bending, the Equalists were clearly gaining popularity at a ludicrous rate, and there was clear escalation that was inevitably going to lead to war. Unalaq’s actions, meanwhile, don’t seem all that urgent. He’s occupying a tribe…but he’s their Chief. His troops are patrolling the streets and…pushing people around a bit with ice and shaking their fists at people. He manipulated events and had his brother banished…two decades ago. Spirits are supposedly going to annihilate the South…but we aren’t effectively seeing that escalate. War is going to happen…but any escalation is happening off-camera. The spirit portal needs to be protected…for some nebulous reason. And so on. We’re being told all this is a bad thing and Korra and Tonraq seem to feel it’s urgent, but we’re not seeing anything on-screen that makes it feel urgent. The nonchalant response of every character aside from Korra and her family doesn’t help. 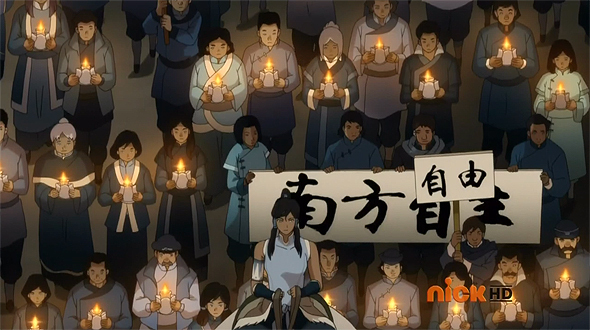 Imagine how much more pressing the threat would feel if (a) we saw Unalaq’s troops causing real oppression in the South (and not just two groups fist-shaking from either side of the road, or (b) we saw Unalaq revealing some sort of dangerous ace up his sleeve that only Korra knows about, and so her frustration, surrounded by people who didn’t see it/don’t believe her, would make sense. Even just a time deadline would make the threat feel more imminent. As it is, it seems that Korra’s running around and angry about something that isn’t all that urgent. I understand what we’re supposed to be feeling: Korra is worried about her tribe and her family, and she will go to any lengths to protect them. The problem is when the stakes don’t seem all that high to the viewer, it just feels like she’s massively overreacting. I love Korra’s anger and impulsiveness, but I also want to be rooting for her to overcome odds that are stacked against her. As it is, I’m finding it very hard to be on her side, even as a huge fan of the character. It’s not just Korra. The characters, in general, feel as if they are reacting disproportionately to events. In this episode, we had Bolin enthusiastically agree to act in a propaganda video intentionally built on lies, and neither Korra nor Asami seemed the least bit concerned about the idea. I would have expected at least one of the three (likely Asami) to wonder why they’re going down the Equalist path of fabricating propaganda to try to convince people to their side. Similarly, no one seemed the slightest bit fazed by Asami agreeing to supply weapons of war. I’m guessing this is leading toward some important plot points and character growth (“I’m becoming my father!”), but it feels like the characters are being forced to regress at one point just so they’ll feel like they’re growing at another. Another example is the way the police reacted to Mako identifying a bombing suspect. Sure, the two cops he was chatting with were probably paid off, but with a terrorist event that important (especially only six months after the Equalist war), wouldn’t the police be questioning every single officer in the vicinity to pool their observations? All these improper reactions make the characters feel like they’re there to serve plot points/advance the story rather than to actually be their own characters. A contributing factor to that is probably the fact that this season is juggling too many characters. Instead of having the core Team Avatar as the focal point, we have an entire cast of characters that we know very little about. I personally prefer a smaller cast, which gives more time to dig into each of the characters and flesh them out. With so many characters, it feels like the majority of them are just being dragged from plot point to plot point “because that’s what happens next” instead of actively driving the story. And the plot points are packed in so densely that the season is skimming over some sequences that could have been entertaining. The moment when Mako used firebending to stay safe during the bomb blast, for example, was a great moment that showcased creative use of bending (which is what makes bending so interesting in the first place.) How great would it have been if it had led to a chase sequence, where we saw Mako and Beifong work in tandem, combining their earth/metalbending and lightning/firebending in creative ways? It could have been action-packed, exciting and creative. Instead, we got Mako looking at a book of criminals and trying to cut through bureaucratic tape, and a filler arc with Tenzin and Meelo that, at least in the context of what we’ve seen so far, had only a tenuous link to the season’s themes. All in all, it feels like this season, the writing team has lost track of the core elements that make the IP so interesting: camaraderie between a small team of interesting characters, outside-the-box action sequences, and a sense of genuine tension/threat. The result is that I just don’t feel invested in this season yet, even after 5 episodes. I still feel something more is up with Unalaq than what we’ve seen so far, whether that’s spirit manipulation or a greater threat. It also seems Varrick is pushing this war so that he can turn a profit, and he’s paying the gangs (and possible the police and Raiko?) to help move things along by creating chaos and blaming it on the North. Other than that, I don’t have much speculation, but I’d love to hear your take on it. Have thoughts or speculation of your own? Please feel free to discuss in the comments section below! I do agree that animation in these episode was a bit disappointing, especially with General Iroh. It’s just too obvious and a lot of people have been pointing that out. As for Varrick, there are some speculations that he’s somehow involved in the explosions but I have to agree with President Raiko on this. Why would the president get involved in a war that doesn’t concern him. He has Republic City to worry about. Let’s not forget that’s it’s been six moths since Amon’s attack and now he’s going to get involved in another one? No, let’s say the city is still recovering from the damage Amon left . I have a feeling Varrick knew that Raiko wouldn’t support Korra. And I also speculate that Varrick will take advantage of Korra’s disappearance to say that Unalaq set the spirits on her, hence giving the south and its leader, Tonraq, more reasons to go up against Unalaq. I really like your theory that Varrick is going to take advantage of Korra’s disappearance! I hope you’re right, because that could be really interesting. Agreed that he has spies in the police station. He doesn’t seem to have any qualms about underhanded dealings that serve his purposes, so it wouldn’t surprise me. I would find it odd if Varrick did not seek the opportunity. He does have a knack for stirring up a crowd. He’s already taking advantage on the Civil war for hiw own benefit. Why not add a bit spice to it. He knows Tonraq will go at any lengths to get find or get Korra back. Everything I’ve been complaining about only seems to have gotten worse so far. They’re clearly hinting at something bigger going on but not really giving us anything to go on which is frustrating. Further, wtf spirit bending? Yeah she hung out with Uunalaq for like 30 seconds but did we actually see him teach that to her? Is the season been that drab that I have forgotten? Also also, how is Spirit Bending something that Uunalaq would know that Aang wouldn’t have and passed on to someone like Tenzin to teach the next avatar? Also also are we ever going to see some Energy Bending a la the end of Avatar: The Last Airbender? and seriously, now that a spirit has eaten the avatar? I hope we finally get some feraking details on the spirits. The whole “angry monsters with no explanation” thing has been driving me batty. The spiritbending training must have happened off-camera, which is annoying. I’m really a bit puzzled by what they’re choosing to show on-camera and off. Also, yes, MORE INFO ABOUT SPIRITS, PLEASE!!! We did technically see energybending at the end of Book One, but like the rest of Korra’s Avatar State stuff, it’s a bit anticlimactic. I bet all her Avatar abilities are going to get more powerful and awesome after her spirit world self-discovery phase.